MANSFIELD — The weather wasn’t beautiful, but members of the Woodville Grace Brethren Church wanted to make sure their neighborhood is. 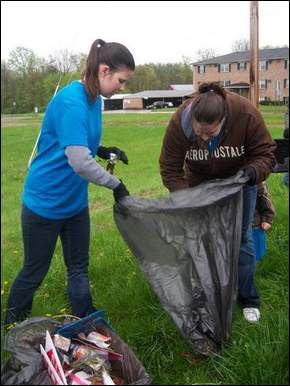 Despite a steady downpour Saturday, 30 volunteers armed with trash bags walked the length of Woodville Road, from Cook Road to Diamond Street, as part of the national Great American Cleanup. Volunteers, ranging from age 4 to 82, split into groups to cover the road. Amber McWatters, 12, said she was enjoying the work. McWatters said the rain made the trash heavier. “Someone found a phone book, but had to put it down because the pages were so heavy,” she said. Hannah Holmes, 10, said the first thing she wanted to do when she got home was jump into the shower. “We hope this will benefit the neighbors on Woodville Road,” Karen Broach said. Aside from the cleanup, Youth Pastor Josh Howlett said he enjoyed splashing in the puddles.